T Hostel, gets bigger and becomes T Hostel @ Victory Monument, only 7-minute walk from Victory Monument and Sanam-Pao BTS Stations. We are happy to host you in our 'Brand New Hostel', feel free to enjoy all our (free!) facilities! The best location: T Hostel @ Victory Monument is only 500 metres from Victory Monument BTS Station, where you can find the Airport shuttles to Suvannabhumi and Don Muang airport, buses, taxis and of course, Tuk-Tuk to explore Bangkok city. The famous Siam Square is easily reachable by 3 BTS stops or by a nice 20-minute taxi ride through the main city attractions. Staff: Our team loves travelling, they have visited more than 20 hostels. As property guests ourselves, we want to provide the best hospitality and experience to other fellow travellors! We speak your language ! Value for money & facilities: We know Bangkok is fun and it’s easy to be a travellor in this city, but we also provide a tour desk and also a private tour. 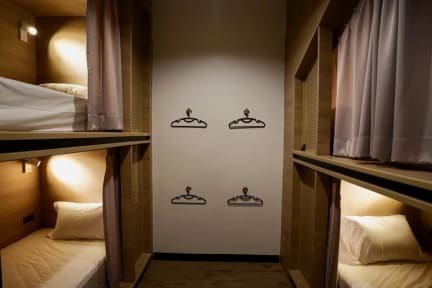 All rooms have free Wi-Fi, TV, air-conditioner, personal locker, reading light, and super comfy bed. Craft Beer: Exploring Thailand is not only about the place, but it’s also about the beer. Very lovely boutique hostel, not the cheapest option but you won't regret stating here. The cafe at reception has great coffee, better and cheaper than any 'Western' style cafe you'll find in the area. Love this spot. Staff if fantastic. Coffee is off the charts. Clean, comfy, great location. Highly recommend this property. I LOVED it!!! Everything about the place was perfect. Super clean, staff were extremely friendly, the cafe is nice and it looks like a co-working space during the day. This hostel is perfect for Digital Nomads! They now have maps of the city hehe, and they give you FREE COOKIES!!! The location is a bit far from the tourist area but a moto taxi will charge you only 50 to 100BATH. Easy to get from the Airport! I will stay here again whenever I come back to Bangkok. A perfect place for me personally. Close enough to major connections to see the city but not deep into the tourist scene. Quiet, clean and comfortable. The WiFi was great, staff lovely and the food was very nice. Laundry for 100THB was well cleaned and packaged. 10/10 I would definitely and probably will stay again. What a great Hostel... Definitely would be my first choice when staying in the Northern suburbs of Bangkok again. All day Breakfast definitely bonus after a late night... Security and Staff are first class... The entrance, cafe reception room makes a great Co-working environment with Excellent Wifi and desk/powerpoint facilities Only one male & female Shower & Toilet per floor so you can expect a wait when the hostel is full.... Otherwise the Beds are super comfy and private. If you need to get to Don Mueang airport this is a great final place to stay in BKK. The hostel is great; clean and modern with a café and close to 7-11 and good cheap places to eat. Beds are comfortable and have curtains, bathrooms are clean and showers hot. Staff were very friendly, scrambled eggs delicious and security great (cards needed to get to rooms). Close to busses and train lines. Not in the thick of things for BKK but super easy to get to DM airport on the bus at Victory Monument. 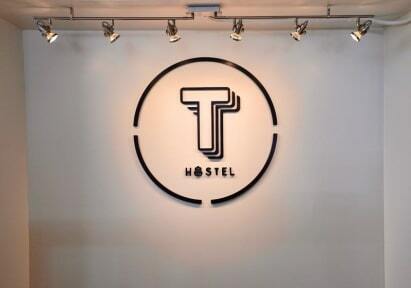 T Hostel was clean and quiet and is perfectly located near the BTS. Easy to get around the city from this location and friendly staff! Very good hostel. Close to everything you need. Clean and be very secure. Will definitely stay here again.